Update - I've added a footnote showing how much hotter it's been getting over summer in south eastern Australia. Climate change is already happening as you know. So do wine growers in Australia. Tasmania produces some rather nice boutique wines. It's going to produce a lot more. Climate change is helping to drive a boom in Tasmania's wine industry with interstate investors seeking cooler growing conditions, the state's peak body has said. The industry is expected to benefit from the long-term effects of climate change, attracting interstate investors and boosting production. Warmer weather conditions are already causing major mainland wine producers to invest in the state after seeing potential in Tasmania's cooler climate. Wine Tasmania, the state's peak wine body, said there had been growing interest from major winemakers who were finding mainland conditions challenging. The trend looks set to continue with figures from the Tasmanian Climate Change Office showing wine production in the state was growing by about 10 per cent a year. "Basically we are in the coolest part of Victoria (for wine) and that won't be cool enough to produce some of our main wines - for sparkling and pinot noir," Mr Brown said. "As the vineyards warm up a few degrees some of the varieties we are currently growing won't be viable in those vineyards in 10 to 15 years time." Mr Brown said warming also presented a major challenge for wines that are suited to warm climates - like shiraz and cabernet - which would lose quality. "In a warmer climate that heat and earlier ripening period creates richer and fuller bodied wines," he said. "But we are seeing a consumer demand for finer wines, more elegant wines and that does not augur well for people who are already making those rich fuller bodied wines." According to these projections, by midcentury Bordeaux could reach the upper temperature limits for growing red varieties, and will fall outside the ideal climate for its white grapes. Other areas are threatened too. Last year an international team of scientists showed that by 2050, some of the world’s most famous wine-making regions, including Tuscany in Italy, will shrink by nearly 70 percent. That doesn’t mean the end of sauvignon blanc or merlot. But in the not-so-distant future, these well-recognized French wines may not come from France. Some wine producers in Champagne or Bordeaux already are moving north and setting up vineyards in southern England. There the soil is similar to the chalky substrate of Champagne, offering a hospitable environment for growing quality grapes. In other parts of the world, growers are expanding into areas previously not known for wine, setting up vineyards in India, Brazil and China. Enjoy your favourite wine while you still can. The next bottle will be different. 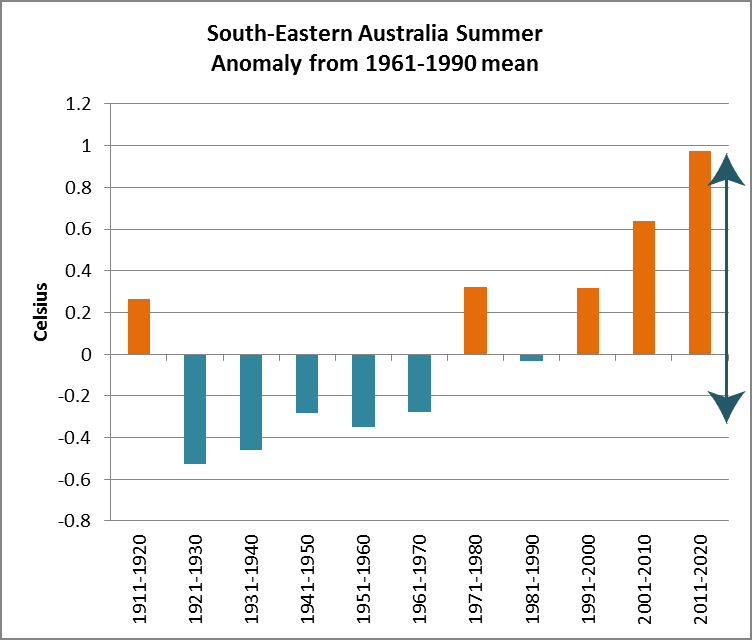 A visitor here is in denial, so I've added a chart showing the temperature increase in south eastern Australia over the past few decades. The previous decade was around 0.9°C hotter than it was in the 1960s. These past three summers have been much hotter still, around 1.3°C hotter. This is the average summer temperature over the whole region. I leave it to you to imagine how hot some days and week have been and how that can affect the grape harvest. It's not just summer, other seasons are changing too. Update: see below for how Anthony shifts the blame! So it is not Anthony’s job to determine whether or not the work of the guest authors will stand the harsh light of public exposure. That’s the job of the peer reviewers, who are you and I and everyone making defensible supported scientific comments. Even if Anthony had a year to analyze and dissect each piece, he couldn’t do that job. Anthony Watts seems to agree that it's not his job to see if articles have any merit or not. And Willis is on the ball when he says that Anthony couldn't tell anyway. Three per cent? 3%? WRONG - it's 30%! Anthony Watts keeps very strange company. Remember last year when he boasted of giving one of his rare, wrong and excruciatingly boring lectures to the Doctors for Disaster Preparedness? Wondering Willis got to go this year and he loved it (archived here). Who'd have thought that they would boast of such a strange alliance. The denialist doctors are a very weird mob. They are tied in with this mob. They are pro-DDT and are anti-vaxxers. They seem to be a survivalist group. I have images of them hoarding lentils and rice in their garages, checking their ammunition and stoking their back up generators while they wait for the apocalypse. Then there's the Cornwall Alliance. That's that wacky cult who thinks that their god will protect them from all natural disasters and they have sworn to deny climate science. Today Anthony's hosted one of their mob, Paul Driessen (archived here), complaining that deniers are being scorned and vilified by, well, Greenpeace from what I gather. Not sure when or where. But Pat Michaels (of Pat'n Chip fame, who's not a member of the Cornwall cult AFAIK but often cited by them) and David Legates (who is a member of the Cornwall cult and coauthors papers with the potty peer, Christopher Monckton) are feeling a mite depressed and must've asked Paul to stand up for their right to reject science. You might remember David. He's the one who told a US Senate committee that CO2 is animal food! Survivalists and a religious cult. What better company could Anthony Watts ask for? In my experience, prolonged exposure to severe sharp pain can make a person hypersensitive to pain, at least temporarily. Well I'm seeing the same effect with Anthony Watts at WUWT when it comes to fear. Studies have suggested that some people process information via the amygdala more and they are hypersensitive to fear. That goes a long way to explaining the following. In fact it explains a lot about deniers. Deniers (ie the plebs as opposed to the disinformers) do appear to react strongly against anything that causes them to be scared. Their brain gets overloaded so they claim "it can't be true". I see it time and time again at WUWT. The words "scare" and "fear" come up a lot whenever climate science is discussed, with claims like "they are just trying to scare us". Christopher Monckton knows very well that the threshold of fear among the denialati is much lower than average. He drafted an email which traded heavily on the scaredy cat tendency, you may recall (email here, which I discussed here). Any normal person would laugh or groan or tsk upon getting an email like that. I don't know how most deniers reacted. What I do know is that he managed to attract people to his events, so it's likely there were some people who didn't consign his email to the spam or trash folder. Two days in a row Anthony's picked on perfectly normal headlines and claimed they are "hype". Now hype happens all the time. Editors want to attract readers so they pick a headline that will scream for attention. Yet that wasn't the case in these two situations. Here are the two cases (click read more if you are on the home page). Not a lot of time today but I just couldn't pass this one up. It seems to me that our current “pause” might simply be that we are at the top of that sine wave I see, and that we might actually see some cooling ahead, assuming it isn’t all adjusted away by the next “improvement” from NCDC. Oh my! 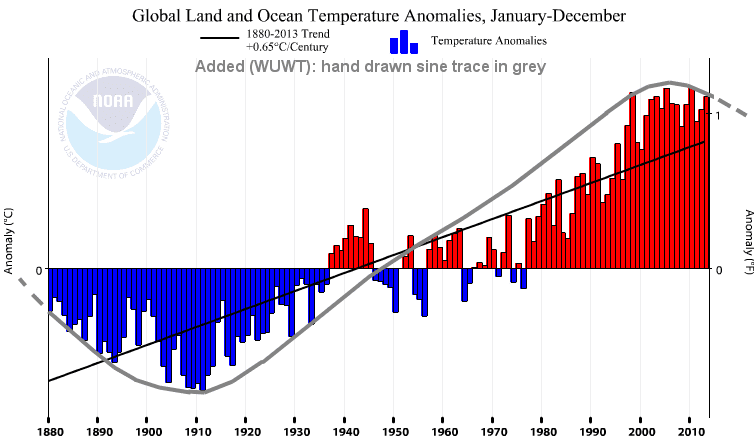 It looks as if Anthony Watts has become a greenhouse effect denier. He speculates that global temperatures will drop by more than 1°C before the end of this century. Click "read more" to see what WUWT deniers have to say. Update: After this article which I tweeted to @curryja at the time, comments from Kevin O'Neill and Izen and two days after writing it, Judith has finally commented that she has changed her article (compare original to revised). She now refers to the headline but does not clarify what Professor Torcello actually wrote or the context or that she grossly misrepresented him and his views. She left the word "outrageous" to refer to Lawrence Torcello's "thinking about climate ethics", suggesting she views the organised funding of misinformation campaigns as more than perfectly okay. Does it fit with her "pragmatic ethics"? Of interest may be the comments like this and this and these, especially in light of the fact that Lawrence Torcello's article attracted so much venom on denier blogs and upwards of 700 hate emails and telephone calls. Following the disinformation on denier blogs earlier this year, Professor Torcello wrote a strongly worded very clear statement (h/t MikeH in the comments below). Sou 12:27 pm AEST 27 July 2014 - amended 12:58 pm to compare changed wording and add more for clarification. I don't go there too often - it's too awful. However today I visited Judith Curry's blog and I found her perpetuating an old lie (archived here). Since, as a bully herself she gets so upset about people "bullying" (ie calling her out on her disinformation and worse), you'd have thought she'd be more cautious. What was her lie? She was repeating the nonsense about the Laurence Torcello article in The Conversation back in March this year. You know, the one that prompted all the hate mail from deniers, some of whom could well have been part of an "organised campaign funding misinformation". My recent post Why scientists should talk to philosophers elicited a comment on twitter (that I can’t find) that recommended Lawrence Torcello as a philosopher that I should be paying attention to. In case the name doesn’t ring a bell, Torcello famously wrote that climate scientists who fail to communicate the correct message about “global warming” should face trial for “criminal negligence”. More traditional (less outrageous) thinking about climate ethics is typified by this Nature essay by Stephen Gardiner.My response to most writings on climate ethics that I’ve encountered has ranged from outrage to a yawn..
No, that's not what Lawrence Torcello "famously wrote". He said nothing of the kind. He didn't say that climate scientists should face trial. Perhaps the philosophers Judith talks to encourage her to be immoral and unethical (Judith's "pragmatic ethics"), although she needs no encouragement. No mention of climate scientists except to say that the majority agree on global warming. Professor Torcello was talking about "an organised campaign funding misinformation", not climate scientists. I don’t believe poor scientific communication should be criminalised because doing so will likely discourage scientists from engaging with the public at all. Well, Judith Curry is one of those rare scientists who should most definitely not be engaging with the public. She's not to be trusted. Let's hope that one day there will be justice for people like Judith Curry. People like Judith Curry, who used to be a Departmental Chair at Georgia Tech professorial chair at a minor university, should be held to higher standards than plebs like the normal denier crowd at WUWT. Is it her pragmatic ethics that allows Judith to promote disinformation? Does it allow her to disregard any twinge of conscience or does she have no conscience? I'd say if the former, she hides it very well, as evidenced by her testimonies to the US Government. I've only just got around to reading Brendan Montague's account of the denier festival in Las Vegas. If you missed it - here's a link to the article. How well have climate model projections tracked the actual evolution of global mean surface air temperature? These tests show that climate models have provided good estimates of 15-year trends, including for recent periods and for Pacific spatial trend patterns. Bob confuses weather and climate. He mistakes climate models for weather forecasts. Bob is a greenhouse effect denier and rejects the conservation of energy. He thinks global warming is caused by El Niño. He has never come up with an explanation of where the energy comes from nor why he thinks El Niño has suddenly decided to cause global warming when it never did in hundreds of thousands of years before. Bob mistakenly thinks the Risbey paper was an evaluation of CMIP5 models. It wasn't. It said nothing about the worth of the models nor about their ability to model ENSO. Bob misunderstands the way "best" and "worst" are used in the paper. Bob misunderstands the way the researchers did the study. He thinks they selected four "models" and he and Anthony Watts made a big point of that. But they were mistaken. I describe below how the research team selected subsets of model runs for consecutive fifteen year windows. Bob confuses replication of the research with checking arithmetic. He mistakenly thinks the work cannot be replicated. It can. All the information needed to do so is provided in the paper itself. You don't even have to start from scratch. The research team tells you which models have SST data to compare with Niño 3.4. It will take a lot of work, particularly downloading all the model runs from the publicly available data (http://cmip-pcmdi.llnl.gov/cmip5/). The observations are readily available to the public as well, including GISTemp, HadCRUT4 and Cowtan and Way. Niño 3.4 values can be got from NOAA, sea surface temperature data from HadISST. plus he makes lots more errors, some of which I describe below. If I had to pick one mistake out of all the mistakes Bob made, apart from not understanding basic thermodynamics and conservation of energy, perhaps Bob's biggest mistake is that he thinks CMIP5 climate models are designed to model day to day and year to year real world weather for the next several centuries. They aren't. That's an impossible task. It would mean being able to accurately predict not only random weather fluctuations but also every action that could affect weather. Such as how many aeroplanes are going to be flying where and when. Where and when the next volcanic eruption will be and how energetic it will be and what will be the composition of the stuff that blows out of it. How the sun will vary over time. Plus being able to find a computer of a size, and people to code, every single possible present and future interaction between the air, the land, animals, plants, the oceans, the ice, clouds, rivers, lakes, trees, the sun and outer space. Humans are good and computers are powerful, but not that good and not that powerful. It's not just random fluctuations and disturbances in nature. We also affect the weather. Scientists model climate with those big computer models, not day to day weather. I've written more below about the difference between models that are used to make weather forecasts and models used for climate projections - with some examples and links to further reading. Before talking about any of the hows and whys of Bob Tisdale getting it wrong, let me follow up my article from a couple of days ago and talk more about the Risbey paper itself and climate models in general. If you want to read more about climate models, I recommend the article by Scott K. Johnson at Ars Technica. Some studies and the IPCC Fifth Assessment Report suggest that the recent 15-year period (1998–2012) provides evidence that models are overestimating current temperature evolution. Such comparisons are not evidence against model trends because they represent only one realization where the decadal natural variability component of the model climate is generally not in phase with observations. The bit I put in bold italics is what this paper is all about. Some people wrongly think that climate models designed to make long term projections should also reflect natural internal variability happening at exactly the same time as it happens in reality. Why they have that expectation is anyone's guess. As you know, even weather forecasts that are primed with the most recent weather observations can only predict weather a few days out at most before chance takes over and they head off in all sorts of random different directions. Climate models that don't have recent observations plugged in, but rely on physics, will include natural variability but that random natural variability will only occasionally be in sync with reality and then purely by chance. It's the effects of long term forcings like increasing greenhouse gases that are evident in climate projections and that's what we are most interested in from them. In other words, long term climate models are for projections of climate not weather. 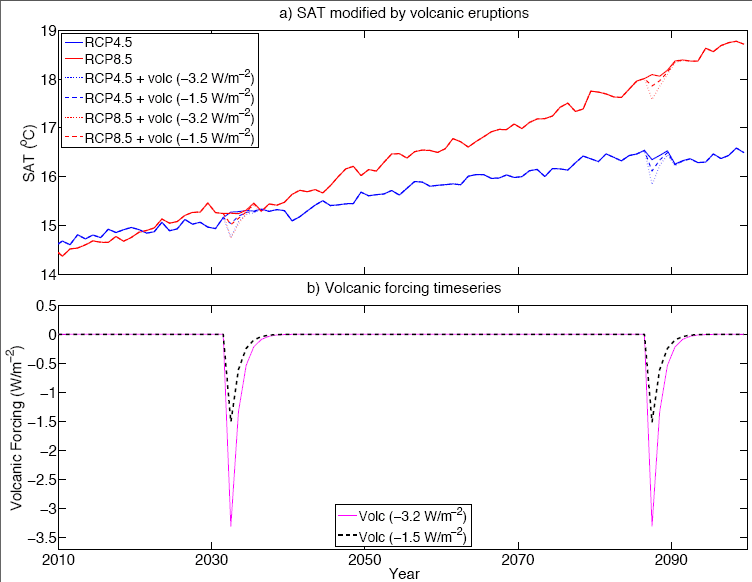 How realistic are climate model projections? The Risbey paper was looking to see if climate model projections were overestimating warming or not. It took a different approach to that taken by other studies. Other studies have looked at the question from different angles. Stephan Lewandowsky has explained three previous approaches in his article about the Risbey paper. You can read about them there, there is no need for me to repeat them here. I will repeat the following from Stephan's article though, because it's a point that science deniers ignore. Observations remain within the envelope of climate model projections. 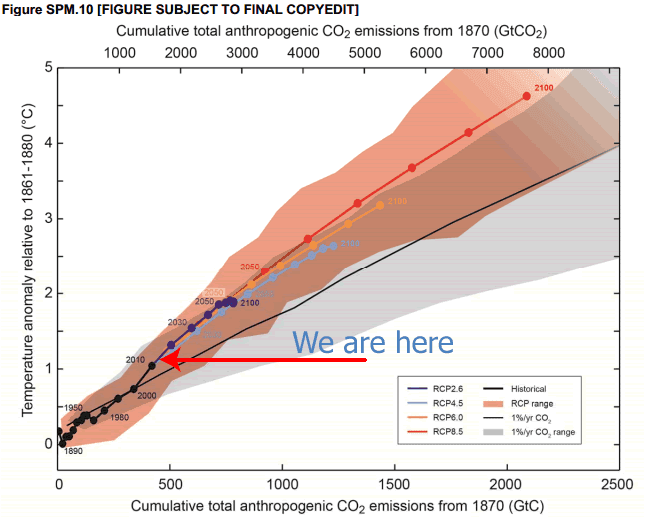 As Stephan showed, this is illustrated by a chart from a paper by Doug Smith in Nature Climate Change last year. The chart above shows three things. First that the overall trend is up. It's getting hotter. Secondly observations are within the envelope of model projections. Thirdly that over time temperature goes up and down and doesn't go up at a steady pace. The bottom part of the chart is the trend per decade. It goes up and down but has mostly been in positive territory since 1970. 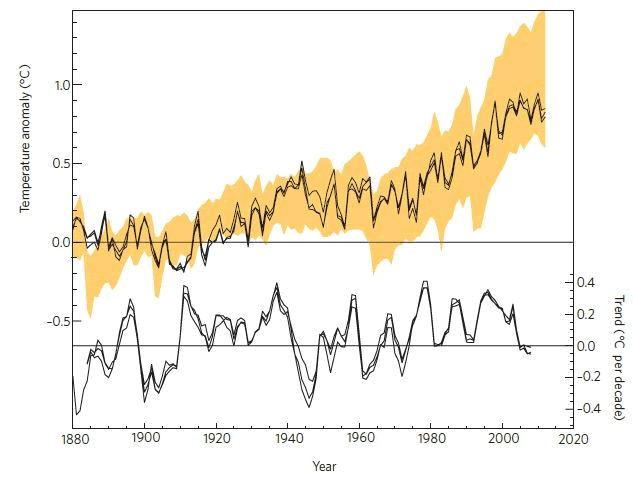 The Risbey paper sets the scene by describing the difference between a climate forecast and a climate projection, then the difference between weather variability and climate. It describes a climate forecast as attempting to take account of the correct phase of natural internal climate variations whereas climate projections do not. Apart from any practical considerations, there are good reasons for this distinction. For climate projections looking ahead from decades to centuries, it doesn't matter much when natural internal climate variations come and go on a year to year basis. The interest is in the long term overall picture. For the next several decades and centuries, the interest will be in how much surface temperatures will rise, how quickly ice will melt, how soon and by how much seas will rise and where they will rise the most etc. Even for projections over decades, we are most interested in regional climate change. Not interannual fluctuations such as ENSO variations so much as long term changes in the patterns of rainfall and temperature. ENSO affects weather. It will happen without climate change. The more important questions for the long term are things like: Will a region be getting wetter or drier? Will it be subject to more or less drought? Will the annual pattern of precipitation change, which will affect agricultural production, water supply management, flood control measures? Climate models aren't yet able to be relied upon for projecting regional patterns of climate change with great accuracy but they can provide a guide. The point is different models are adapted and used for different purposes. There are models used to predict short term weather. Some forecasts are fully automated (computer-generated) and others have human input. They are only useful for looking ahead seven to ten days. They are good for guiding decisions on whether to pack an umbrella, plant a crop, be alert for floods or scheduling construction tasks. There are models that are constructed or adapted to make medium term weather forecasts, like those used by the Bureau of Meteorology to predict ENSO looking out over a few weeks to months. They are useful for making farm management decisions, utility companies making decisions on water storages (store or release water from dams), putting in a rainwater tank if it looks as if the next few months will be dry etc. They are forecasting weather not climate. Then there are models adapted or constructed for longer term regional outlooks and models developed to look at the world as a whole. Climate models are used for more than just surface temperature. It's surface temperature that probably gets most attention in the media and on denier blogs. The world as a whole is warming up very quickly. Different parts of the system heat up at different times at different rates. Sometimes the air heats up more quickly than others. Different depths in the oceans heat up at different rates at different times too. Ice melts, but not at a steady pace. All that is because all these different parts of the system are connected. Heat flows between them. Anyone who goes swimming will have experienced the patches of warm water and patches of cold water in lakes, rivers and the sea. Just as heat is uneven on a small scale, it's uneven on a large scale. I know some of you will be wondering why I'm taking readers back to climate kindergarten. Well if you read some of the comments to the previous article you can guess why. And if you manage to wade through even a part of Bob Tisdale's article at WUWT and the comments beneath, you'll get an even better appreciation. All that is a prelude to the Risbey paper. It was looking at whether or not the recent global surface temperature trends are any different to what can reasonably be expected from model projections, given natural internal variability in the climate. So the first thing to understand is that the CMIP5 climate model projections used by the IPCC will not generally model internal variability in phase with that observed over the model run. They do include internal variability but it's a stochastic property. It's purely a matter of chance when any model will show an El Niño spike or a La Niña dip in temperature for example. Whether a particular spike or dip lines up with what happens is pure chance. Sometimes a model run will be in phase with the natural variability observed and other times it won't. It's not important. Over time the natural internal variability cancels out. It's the long term trends that are of interest here, not whether an El Niño or La Niña happens at a particular time. I call it the Risbey approach because James Risbey from Australia's CSIRO was the lead author. However I believe it was Stephan Lewandowsky who came up with the idea to take a look. Stephan thought it would be interesting to see what would be the effect on observations if the modeled natural internal variation was in phase with those observed. Recall the point about climate models incorporating internal natural variation, but not necessarily in sync with when it happens in reality. So what the team did was to look at windows of fifteen year periods and scan for model runs that were most closely aligned with observations, taking ENSO as the main measure of internal natural variability. This brings us to the opening paragraph of the Risbey paper. On a short time frame, to see if models are reasonable, one needs to look at models that forecast. In other words, models that include natural internal variation that is in phase with what actually happens. Short to medium term forecast models do this by initialising them with the most recent observations or incorporating of the latest observations. Most climate projection models are independent of recent observations. They are based on physics not live readings of what is happening. So if they happen to be in phase with internal natural variability at any time, it will only be by chance. If you want to allow for natural internal variability and compare models with observations, one way you can do that is to look at model runs that happen to have a period of natural internal variability in phase with observations for the period of interest. That's what the Risbey team did. Risbey14 looked at individual model runs and compared them with observations. For each fifteen year period they selected the model runs that were in phase with real world observations in relation to ENSO. They started with 1950 to 1964, then 1951 to 1965, then 1952 to 1966 etc. After selecting the models most closely aligned with ENSO phases observed for one fifteen year period, they moved up a year and looked at the next fifteen year period and so on. As well as that they were able to select, for each fifteen year period, the models that were most out of phase with ENSO. Don't take too much notice of the actual data. It's a composite CMIP5 with GISTemp. And I'm not suggesting they eyeballed like that. They didn't. The above is just to get across the concept of what was done. In practice, the researchers selected model runs on the basis of their similarity in timing with real world observations of Niño 3.4 and related spatial patterns of sea surface temperature in the Pacific. [Correction: Stephan Lewandowsky has advised that during the selection phase they didn't look at the spatial patterns beyond Niño 3.4, which makes sense in the context of Figure 5 discussed below.] The image above is just so you get the idea that they looked at fifteen year periods starting with the period from 1950 to 1964. The meaning of "Best" and "Worst"
That leads me to the discussion of "best" and "worst" that you may have read about and that Bob Tisdale got so wrong. The research was not evaluating models. There is labeling on Figure 5 in the paper, which uses the words "best" and "worst". However there is no suggestion that the four "best" models are in any way superior to the four "worst" models in terms of what they are designed to do, which is future projections of climate. The word "best" denoted the subset of model runs in any fifteen year period that were most in phase with observations for ENSO. Conversely the word "worst" denoted the model runs that were least in phase with ENSO observations. The point being made was that the model runs most in phase with the real world ENSO observations had a "PDO-like" spatial pattern of cooling in the east Pacific. Look at the above charts close to the equator near South America. In the top left hand chart, while not as cool, the overall pattern is closer to the observations on the right. In the bottom chart, the warming is smudged all over and it doesn't show the cooler east Pacific. Figure 5 showed that the model runs most out of phase showed a "more uniform El Niño-like warming in the Pacific". Bob Tisdale was thrown by the word "best" and "worst". He also seemed to think the climate model runs should have been identical to the real world. He's wrong because he doesn't understand what CMIP5 climate models are for or how they work. As the paper states, when you select only the model runs in phase for the period, you get much closer spatial similarity, not just a closer match for the surface temperature as a whole. When you lump all the climate model runs together, the multi-model trends average out the internal variability. Models will cancel out the effect of each other when you lump them all together, because on shorter time scales, it's only by chance that some have internal variability in phase with the real world. When it comes to "best" and "worst", the paper was only referring to the extent to which selected model runs were in phase with the real world. There is no suggestion in the paper that any one model was any better as a model than any other. The research was not an evaluation of climate models. In fact, different models were in and out of phase in different fifteen year windows. Just because by pure chance a model run was in phase with ENSO over a particular time period did not mean that same model run was in phase with ENSO in other time periods. Now, if you have a large enough sample, then in any fifteen year period some model runs will line up pretty well with natural fluctuations in the real world. Just by chance. So if you want to see a short period of time, like say the last fifteen years, you can see if any model runs line up with ENSO over that period and if they do, how close are they overall to global surface temperature observations. That's probably the nuts and bolts of the paper. Comparing all model runs for a short period like the last few years won't tell you a whole lot about whether the models are realistic or not. That's because individual model runs won't necessarily be in sync with the real world in regard to natural variability. They are expected to reflect the dominant climate forcings but not the exact timing of ENSO for example. By looking just at model runs that just happen to be in sync (by chance), you can see how much they vary from the real world observations. This study showed that once you allow for the fact that models won't be in phase with natural variability, then the models are even closer to real world observations. I'll finish with the two figures showing trends, that Stephan had in his article. The one on the left is from the "in-phase" model runs compared with observations. The one on the right is those least "in-phase" compared with observations. As always, click to enlarge. For another perspective, with links to related papers, Dana Nuccitelli has an article on the subject at the UK Guardian. Here's the link again to Stephan Lewandowsky's article, which also has links to related papers. I wrote previously about Gavin Schmidt's paper on this topic, taking a different approach. Acknowledgement: Thanks to James Risbey for answering my naive questions so promptly. Thanks to Stephan Lewandowsky for describing the work so well. Any mistakes in this article are mine. It wasn't checked by any of the paper's authors before publication. Since then, I've made one correction, thanks to Stephan L. And thanks to all those who made available a copy of the paper so I could write this article - RN, AS, JR and SL. Has a "climate journalist" discovered a major blunder? Update 2: I've written two more articles about this. The main one is about the paper itself and points out some of the errors made at WUWT. The other was an interim follow up to the release of the paper. Update: the Risbey paper is out (h/t Steve Bloom) and can be accessed here at Nature Climate Change, but you'll need a subscription. Stephan Lewandowsky has been good enough to write about it on his blog. Even if Anthony had a year to analyze and dissect each piece...(he publishes on his blog, he couldn't tell if it would)... stand the harsh light of public exposure. As a climate journalist running the most viewed blog on climate, I have been graciously provided an advance copy of the press release and paper Risbey et al. (2014) that is being held under embargo until Sunday, July 20th. I am in the process of helping to co-author a rebuttal to Risbey et al. (2014) I think we’ve spotted a major blunder, but I want to check with a team member first. If Anthony Watts is a climate journalist he hides it well. Anthony is hopeless at the job. He posed as a journalist to get a free press pass to AGU13, but the most interesting thing he "reported" was that he could hear the sound of smirks. The rest could not be described as "journalism" by any stretch of the imagination. At first I had trouble finding your email, which is why I sent it to Ms.Oreskes first. I dare not send it to professor Lewandowsky, since as we have seen by example, all he does is taunt people who have legitimate questions. This is the same Anthony Watts who thinks dumb questions are "legitimate". Anthony doesn't like being "taunted". If you're interested, the question that Anthony posed was related to climate models and the simulation of "spatial patterns of the warming and cooling trends in sea surface temperatures during the hiatus period". There was a special issue of Nature Geoscience this March, which had a number of articles relating to global warming over the past few years. And there've been other papers, such as this one by Yu Kosaka and Shang-Ping Xie in Nature. Getting back to Anthony's question - he said he wants to "check with a team member first". But that claim is contradicted by the fact that he was so excited that he might have found "something wrong" that he preempted any reply by writing about it on his blog. True to form, Anthony doesn't wait for the answer, but posts about his "cleverness" on his blog. That's the point. He doesn't care about the answer. All he cares about is that a question at WUWT, any question, no matter if it's dumb or on the ball, is fodder for dumb deniers to claim AGW is a hoax. We'll have to wait and see if Anthony Watts and perennially puzzled Bob Tisdale have accidentally been right this time. Since we don't yet know what the paper is about (though we can take a stab at guessing the general topic), there is insufficient data to come to any conclusion. Very well written!! Nothing “extra” added, simply asking a question. It will be interesting to see if you get a response, or the release gets pushed back. I was going to ask if you were sent the supplementary data that so often accompanies papers published in Nature, but it is unusual for papers relying on separate supplements to refer the reader to them, so I am supposing this is not an oversight of the sender in this case. Very well handled. At the time of archiving there were 130 comments. So many strong opinions about a paper that has not yet been released from the embargo. About a paper of which no-one but Anthony and Bob Tisdale know the subject. About the authors of the paper, and about Anthony's cleverness and astuteness as a "climate journalist". some of us won't weather the weather at all.